I really wish I could provide you with structured, reasoned post written in full paragraphs that more or less hung together. But I can't: things are moving too quickly, and I promised myself I would work on my SSHRC grant application today. So here are some quick points. The odds of a Canadian version of the financial meltdown happening anytime soon are very small. Say what you will about the cozy clique of Canadian banks, it must be acknowledged that they are well-nigh indestructible. There were no bank failures here in the 1930's, and it looks as though they'll pull off the same trick this time around as well. I haven't seen data or heard of anecdotes that suggests that credit in Canada is drying up. That doesn't mean there isn't any; I just haven't seen it. Or maybe I missed it; if you see something (for example, over here) that suggests otherwise, please let me know in the comments. As long as the Bank of Canada can keep dealing with the liquidity issues, the main problem will be dealing with the slowdown in the US real economy. If the recent expansion had been driven by exports of manufactured goods to the US, we'd be in deep, deep trouble right now. Let's all be grateful that this isn't 1998. The concern is what will happen to commodity prices. China has been an important driver of global demand. Can they keep it up? Paul Wells often makes the point - in his book, and more recently here - that one of Stephen Harper's long-term goals is to reduce the size of the federal government. I don't think that there's much doubt that this is a goal of the Conservative government. What's much less clear is whether or not this goal has had much of an effect on the trends set in place by Jean Chrétien and Paul Martin. As a share of GDP, revenues have been gradually falling for almost 10 years, albeit at a more measured pace since 2001. But since GDP has been growing over this time, revenues have been able to sustain an upward trend. As a share of GDP, program expenditures have been growing since 1999. At some point, these trends will produce chronic deficits, so this won't go on for much longer. And it's probably a good bet that the Conservatives will deal with the issue by cutting spending, not by increasing taxes. Then again, it's also a pretty good bet that that Chrétien's or Martin would have done the same thing; take a look at how they dealt with the deficit in the 1990's. So it looks as though we're going to end up with a federal government that is about the same size as it was in the mid-60's. Stephen Harper may well be pleased with the prospect, and all he really has to do to get there is follow the path set out by his Liberal predecessors. Canadian institutions are in considerably better shape than their international peers. Their losses on structured products have been relatively modest. More importantly, their absolute leverage is markedly lower. As a simple illustration, major Canadian banks have an average asset-to-capital multiple of 18. The comparable figure for U.S. investment banks is over 25, for European banks is in the 30s, and for some major global banks is over 40. While foreign banks are in the process of moving towards Canadian levels, our banks obviously face no such pressures. Indeed, Canadian banks could modestly increase leverage by growing their lending relative to their current capital base. This may explain those rumours of Canadian banks circling around the wounded US financial sector. I really don't understand this. At all. Canada could be headed for mortgage meltdown, says Merrill Lynch Canada: In a report issued Wednesday, Merrill Lynch Canada economists said many Canadian households are more financially overextended than their counterparts in the United States or Britain. They said it's only a matter of time before the "tipping point" is reached and the housing and credit markets crack in Canada. Once again, a financial institution makes headlines based on a news release based on a report that no-one can read (at least, I can't find it). Why on earth do journalists think that this sort of thing is newsworthy? Especially when no-one else can make head nor tail of it. I've not seen any evidence that the Canadian housing market is as wildly over-priced as it was in the US; if anything, it could be argued that house prices have been too low. But hey, it got Merrill Lynch Canada some publicity. And that's all that matters, isn't it? Well done, you brave stenographers of the financial press! This is cross-posted on democraticSPACE. There are a lot of published opinion polls out there: I count 41 since September 8. The trouble is that many of them contradict each other - just what are we supposed to make from all this? Let's haul out our introductory statistics textbooks and take a closer look. Firstly, let's get an idea of the sort of variations that we should expect to see, that is, the inherent uncertainty with drawing random samples. 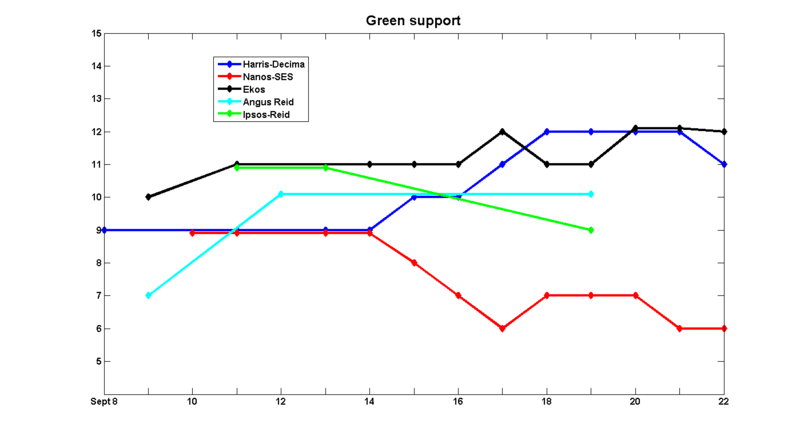 Ekos, Nanos and Harris-Decima are all publishing daily tracking polls, with announced 95% confidence intervals of 1.6%, 3.1% and 2.6%, respectively. If sampling error were the only source of uncertainty, what would a typical deviation between Nanos and Harris-Decima look like? (I'm choosing those two because they have the larger announced MOE; what follows will be an upper bound for the variations we should expect.) The answer is not 3.1 + 2.6 = 5.7%. If we play around a bit with the arithmetic of confidence intervals, the standard deviations for the Nanos and Harris-Decima estimates are 1.58 and 1.33, respectively. If Nanos and Harris-Decima are operating independently, the standard deviation for the difference between the two estimates is (1.582 + 1.332)1/2 = 2.06. From this, the half-width of the 95% confidence interval is 1.96*2.06 = 4.05. If sampling error were the only thing to worry about, the chances of seeing a gap of more than four percentage points is 1 in 20. It also follows that the probability of observing a discrepancy of 5 or more points is 1 in 65, and the odds of seeing a 6-point gap are 274:1 against. So much for the theory; what are the variations we're actually seeing? First up is the support for the Conservative party; click the image for a full-sized version. In all the graphs that follow, the scale of the vertical axes is the same, so that differences in poll results are the same distance apart. So far, so good: it is almost always the case that the polling firms differ by 3 percentage points or fewer. Indeed, there have been many days where two or three polling firms come up with the same estimate. It's also interesting to note that of the 26 polls published since September 15, only two are outside the range of 35-38%. Now the New Democrats; again, click the image for a larger version. 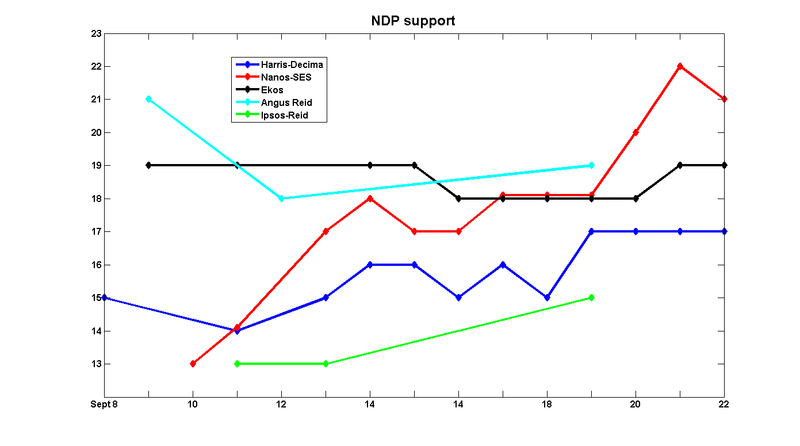 The range of variation is greater than was the case for that of the Conservatives, but at least some of that can be attributed to the fact that NDP support appears to have been growing during this period. 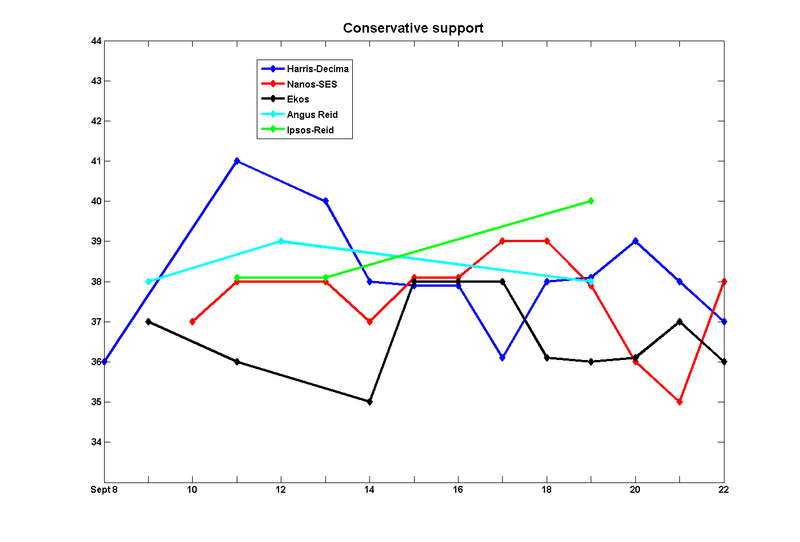 Aside from Ekos - which started with high initial support - all the polling firms show a discernible trend upwards. In contrast to the fairly tight variation we've seen so far, the gaps between the reported estimates for Liberal support are implausibly large: discrepancies of 8 points - in theory, an event that should occur 1 time in 10,000 - are not uncommon. Something is seriously wrong here. Discrepancies of 5 or 6 percentage points should be rare (especially for the Greens), but we're seeing them pretty much every day. 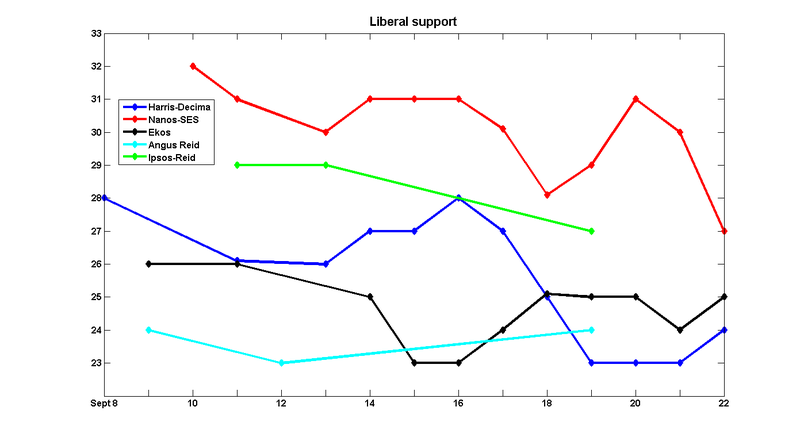 It seems pretty clear that Nanos is the outlier here: their numbers for the Liberals are consistently higher, and their estimates for the Greens are consistently lower than what the other firms are reporting. It seems that there is a significant chunk of the population - something around 4% - that is telling Nanos that they'll vote Liberal, but telling everyone else that they will vote Green. Why? And what does this mean for what will happen on October 14? Mr. Nanos says the key difference is methodology. Unlike other polling firms, his asks open-ended questions on voter intention. Instead of offering a list of choices -- "Would you vote a) Conservative, b) Liberal ..." -- Nanos phone operators ask an open-ended question that requires respondents to come up with their own answers instead of multiple choice. "If they don't get the list, you get the cleanest read because they have to articulate their support," Mr. Nanos said. The open-ended question eliminates the importance of the order in which the parties are listed, although most companies vary the the order to mitigate this factor. Also, the open-ended method tends to put the Greens lower than other parties because, Mr. Nanos believes, respondents are not reminded of the party when they answer. Some will choose the Greens as a none-of-the-above if they hear the party name on a list before answering. But it's much less easy to figure out what this segment of the population will actually do on election day. Will they indeed vote Liberal? Will they be reminded of the alternatives when they get to the voting booth (the party names are listed on the ballot) and vote Green? Or will they simply not vote? The Liberals will go back to giving tax breaks to income trusts. I have to wonder what Ralph Goodale must be thinking about all this. It was a good idea to remove those tax breaks, and it's still a bad idea to put them back in place. The NDP will repeal corporate tax cuts. Sigh. When will they ever learn? Not only are corporate taxes among the worst for reducing investment and economic growth, they aren't even progressive. NDP Leader Jack Layton made a similar promise, vowing to create 150,000 spaces across the country within the first year of a mandate at a cost of $1.4-billion. Both parties offer the same choice to parents. Call it the Rumpelstiltskin model: they are willing to provide money, but you must surrender your child in return. I realise that it is unfair to compare the Liberals and the NDP to a villain of a fairy tale. Unfair to Rumpelstiltskin, that is: he at least brought something - his ability to spin gold from straw - to the table. The Liberal-NDP position is based on reallocating gold spun by taxpayers. This is not an exaggeration. Remember Scott Reid's "beer and popcorn" crack in 2006? It was a gaffe in its purest form - the inadvertent revelation of the truth. And when I listened to Olivia Chow insist on 'publicly-provided, not publicly-funded' daycare, I wondered if it had ever occurred to ask herself why. The awfulness of the Liberal-NDP position is not restricted to its unapologetic paternalism. (Will I get through this post without using the expression "nanny state"? Apparently not.) It is also inegalitarian, regressive and inefficient. The Harper government has taken creative licence to an extreme in dubbing the $100-a-month cheques it sends to families with young children a "universal child-care benefit." It may be universal for children under age 6 (although the fact it is taxable means some families keep very little of it). But with a single day of infant care in some licensed daycare centres costing $70 or more, it doesn't even begin to cover the staggering child-care costs that burden many families. Let's do a little back-of-the-envelope arithmetic. According to this editorial, the total cost of sending $100 cheques each month is $2.4b/yr; that works out to 2m children. The NDP program calls for $1.45b to finance 150,000 daycare places, which works out to about $800 per month. That's certainly an improvement over the existing $100/month - but only if you happen to be one of the 7.5% of families who will benefit. The other 92.5% will see nothing. This project is profoundly inegalitarian: it will create a small class of insiders who have generous access to public funds, and it will do absolutely nothing for everyone else. If those 7.5% were families at the very bottom of the income distribution, that could be sold as a progressive policy. But it's not; it's being sold as a step towards a universal daycare program. If the aim of the policy is to help out low-income parents, our experience with the Quebec model isn't very encouraging. As explained in great detail over here, the average subsidy to families in the highest income quartile is more than twice that received by families in the lowest quartile. And then there are efficiency considerations. It is well known that cash transfers are a better way of redistributing income than providing in-kind goods and services. A lesson for the Liberals and the NDP: if you want to help low-income families, give them money. It really is that simple. The GST cut: stupid economics, smart politics? It's not always true, after all, that long-term change and electoral expediency are necessarily antagonistic. The GST cut is a case in point. Economists, or at least economists who aren't named Stephen Harper, hate it. As a mechanism for encouraging growth and competitiveness, cuts to consumption taxes are widely reckoned to be the least efficient policy tool. Roger Martin is the dean of the University of Toronto's blue-chip Rotman School of Management and chairman of Ontario's Institute for Competitiveness and Prosperity. "Cutting the GST," Martin has said, "was a terrible idea. Terrible in every respect." Well, all but three, from Harper's perspective. First, it won the Conservatives a lot of votes. Second, the opposition parties are terrified at the thought of reversing it, which means it's probably permanent. Third, and most important, it gets a lot of money out of Ottawa — perhaps $30 billion over the next five years. The economist's argument is that if you want to finance government spending, consumption taxes are the best way to go. But I guess if you don't want the government to do any spending in the first place, the point is somewhat moot. It's going to be hard to implement the game plan for social democracy if you're afraid to step on the field. Why aren't there more stories like this in the MSM? An economics lesson for Stephen Harper (and everyone else, come to that), in which Ottawa Citizen columnist Dan Gardner gives Greg Mankiw a call. It's a clear and readable explanation of the economics of climate change policy, in 800 words or fewer. And all a journalist had to do was call an economist and ask a couple of questions. 1. The "Green Shift" is complicated and difficult to understand. It's not. Seriously. How hard can it be to figure out? Carbon taxes up. Other taxes down. End of story. It's much easier to understand than the cap-and-trade models of the other two parties. 2. Stephen Harper is the most credible leader on economic issues. Excuse me? Yes, he may have a post-graduate degree in the field, but it's not as though he's putting it to good use or anything. A non-economist Prime Minister who ignores the advice of his officials and cuts the GST is one thing. But a Prime Minister who presumably already understands why the GST shouldn't be cut - and then does it anyway - is quite another. 3. Federal Canadian politicians have anything useful to say about the ongoing financial crisis. Journalists, if you really want to know how the meltdown on Wall Street affects Canada, give Mark Carney a call. He understands the problem, can speak intelligently on the issue, and the means to react appropriately are at his disposal. None of this is true of the politicians, so for pity's sake, please stop asking them to comment. And if they volunteer quotes, keep them to yourselves. The campaign is generating quite enough silliness on its own. Alternate title: "Dear Jack Layton: The 1970's called - they want their economic policies back." Stop the export of Canadian jobs overseas through new, manufacturing-friendly trade policies while adopting a Made-in-Canada procurement policy for the federal government and its agencies. New Democrats will commit an average of $2 billion a year to this program, aiming to directly create 40,000 new manufacturing jobs and thousands of spin-off jobs while protecting many more. Okay, training is a worthy cause, but everything else is either pork for the NDP base or just plain stupid - and some are both. $2b/year for 40k jobs works out to forking out $50k/year per job - why exactly is this a good idea? Some estimates suggest there have been 400,000 manufacturing jobs lost across Canada since 2002. The transition of employment from manufacturing to other sectors is going much more smoothly than what we might have predicted from such a sharp decline in employment: there has been no spike in layoffs or in unemployment. The most important factor leading to the decline in employment in the manufacturing sector is attrition: workers who leave are not being replaced. Unemployment in the manufacturing sector has declined by some 50% since 2002 - so why is the NDP throwing so much cash at this one, relatively small sector that is handling its decline surprisingly well? I'm extremely sympathetic to the idea of helping unemployed workers adapt to changing economic environments. But the overwhelming majority of them have no ties to the manufacturing sector. Tories to cut diesel, jet fuel excise taxes: Conservative Leader Stephen Harper is promising to cut federal excises taxes on diesel and aviation fuel in half over four years. Mr. Harper is pledging to cut the tax by 2 cents -- taking it to two cents per litre from the current four cents. It would cost Ottawa $600-million per year. This is unfathomably stupid. In one stroke, it takes two serious and pressing problems - the deteriorating fiscal situation and greenhouse gas emissions - and makes them both worse. Harper himself said Tuesday the diesel-tax cut highlights the choice between the parties' two different plans in the face of uncertain economic times. "Our plan is practical, theirs is based on theory," he said. "That's what the election is all about." Gaahh. The election is still five weeks away, and I'm already running out of synonyms for 'stupid'. After ten years of surpluses, we can perhaps breathe a little easier. The debt is less and less of a burden, and the cost of servicing it is almost back to what it was in the 1960s. So now that the deficit is not the burning preoccupation it once was, we can start thinking of other priorities. Do we ... decide to cut taxes? Or do we ... decide to increase spending? It would appear that Stephen Harper's government has done both. The Department of Finance will be releasing the final numbers from 2007-8 in a couple of weeks, and I'll revisit the graphs in that brief history post when they come out. It's been a very long run, but the era of indestructible federal surpluses is over. US voters have a date with destiny. Canadian voters have an appointment with the dentist. And so it begins. The federal election campaign will be nasty and brutish, but at least it will be short. Economics and the economy are likely to be major themes of this election, so there will be more posts about Canadian politics than usual over the next few weeks. How can strong US GDP growth be reconciled with all the other bad news about the US economy? How can weak Canadian GDP growth be reconciled with all the other really-not-all-that-bad news about the Canadian economy? Notwithstanding the nasty July numbers, employment in Canada has been growing much faster than in the US over the past few years. If you didn't look at the GDP numbers, you wouldn't be thinking that we were flirting with a recession. As StatsCan's Phil Cross noted, "A recession does not have record-high auto sales and a very tight labour market." When a country consumes much more than it produces, then at some point, it has to repay some of the debt incurred. Repaying involves producing more than consuming. We're not even at that point yet -- we're merely moving toward producing more than we're consuming. That's almost certainly correct, but I think there's more to it. And it comes down - as so many things do these days - to movements in the prices of oil and other commodities and their effects on the terms of trade. Since foreign trade is such a large part of the Canadian economy, the improvement in Canada's terms of trade - the fact that we are now able to buy more imports for the same amount of exports - has been the driving force for the increase in real incomes that we've seen over the past few years. Foreign trade is less important for the US, so it's less clear that the deterioration in the US's terms of trade matters all that much. But it does. A useful metric here is what the development economics literature refers to as the 'labour terms of trade': the ratio of prices of production and consumption goods (see this post for more). When the labour terms of trade are increasing, producer prices are rising faster than those of consumption goods, so the real purchasing power of workers increases, even if productivity remains constant. But when consumer prices are increasing faster than the prices of the goods they are producing, then higher productivity may not be enough to prevent a decline in workers' welfare. In Canada, the continued improvement in the terms of trade has led to a steady improvement in the labour terms of trade. But up until 2007, US consumers had been fairly well insulated form the deterioration in their terms of trade. But since 2007, the US labour terms of trade have deteriorated sharply: the relative price of producer goods to consumer goods has declined by 2%. Even though the amount produced in the US has increased by 1% since 2007:3, real incomes - measured by the CPI deflator - have fallen by 1%. Add in the reduction in employment, and that would indeed feel like a recession. The opposite story is happening up here. Although output has remained steady since 2007Q3, the purchasing power of that production has increased by a respectable 2%. All this leads us to the inevitable question of just what is a recession. Is it a reduction in economic activity or of income? Usually it's both, of course, but what do we conclude if we see only one of the symptoms? To sum up in terms of a not-particularly-clever metaphor, Canada and the US are canoeing in opposite directions on a river with a strong current. The US is heading upstream and paddling hard, but not hard enough to prevent the current from carrying it downstream. Canada is heading downstream, so it can afford to take a break and still get where it wants to go. Which country is in recession? The one that is working hard and going backwards? Or the one that has stopped working but is still coasting forward?